Kids today. They’re at a concert, but they’re too busy texting and chatting on AIM on their cellphones. For Generation Why? 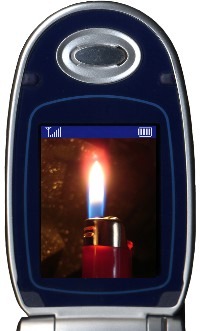 !, we now have lighter images for your cellphones, so you don’t have to be bothered to take your cellphone and a lighter to the next Pussycat Dolls show. Available for US$1.99 (US customers only?) from Modtones. Better idea from Modtones: mistletoe wallpaper for your phone. I’m sure that will get you some love at your office holiday party.